A Seoul court on Friday (Oct 5) jailed former South Korean President Lee Myung-bak for 15 years, making him the latest in a string of high-profile political and business leaders ensnared by corruption charges. Lee is the fourth former South Korean president to be jailed, with his successor Park Geun-hye imprisoned over a separate graft scandal that toppled her from power in early 2017 and fed concern over cosy ties between government and business. 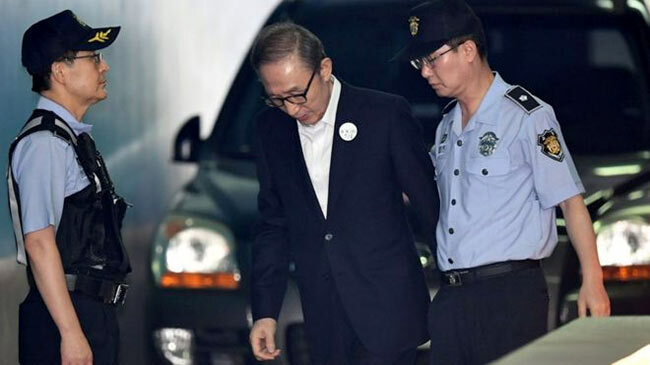 Lee faced charges of having accepted around US$10 million in illegal funds from companies such as conglomerate Samsung and his own intelligence service, but he denied any wrongdoing, saying the investigation was politically motivated.